Stars like the Sun, our star, will have an average lifetime of ten billion years. The Sun is currently in the middle of that lifetime. Examining the birth, life and death of other stars ( stellar evolution) and stellar structure of other stars provides insight into where the Sun came from and what it’s ultimate fate will be. Alternatively, the Sun provides an opportunity to look deeper into the details of the inner workings of a star, which has proven to be very complex. This highlights the importance of not only studying the Sun as it relates to our solar system, but of viewing the Sun as a window into the lives of the myriad of other stars in the universe. Stellar evolution begins with an enormous cloud consisting of hydrogen gas mixed with other trace elements. If the cloud is sufficiently dense, the force of gravity will cause this cloud to contract and a proto-star will form. The proto-star continues to contract and its temperature rises until it reaches hydrostatic equilibrium (i.e., the point when the outward gas pressure matches the inward pull of gravity). At this stage, the proto-star becomes a star known as a T-Tauri star. The infant star then begins it’s decent down the Hyashi track. During this short phase of it’s life the star is fully convective and its core temperature continues to rise. With a sufficient mass (at least ~0.08 M_Sun, where M_Sun is the mass of the Sun), the star will compress until its core temperature becomes hot enough (~10^7K) to begin the nuclear fusion of hydrogen. With this ignition of nuclear fusion, the star graduates to adulthood: the Main Sequence. This is the phase of the star’s life where the nuclear fusion of hydrogen into helium occurs in the core. 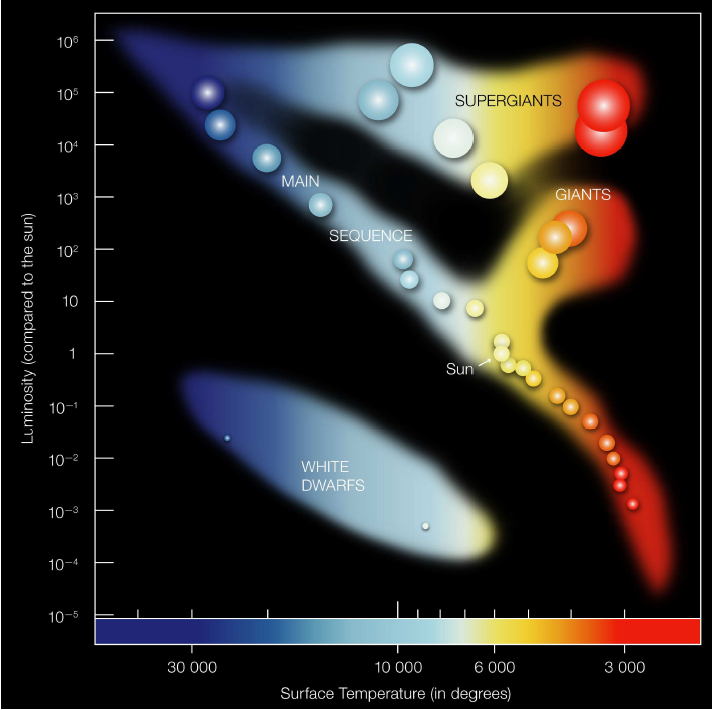 The Hertzsprung-Russell (HR) diagram best characterizes the life cycle of a star. The H-R diagram was conceived of in the early 1900s by Ejnar Hertzprung and Henry Norris Russell. Separately, both astronomers had the idea to plot the surface temperature (sometime called the effective temperature) of the stars versus their luminosities. The majority of stars (~99.9%) occupy the Main Sequence region of the HR diagram. The duration of this process is dependent on how much hydrogen is present and how quickly the nuclear fusion progresses. More massive stars contain more hydrogen, and thus their gravitational contraction is also greater. This increased gravitational contraction results in the star becoming much hotter and thereby an increased rate of nuclear fusion. The net result is that the more massive a star is, the shorter the star’s lifetime will be. However, generally more than 80% of a star’s lifetime is spent in this phase of it’s life. The ultimate fate of the star will depend on the star’s mass. As the hydrogen in the core of most stars is exhausted, hydrogen will begin burning in the outer layers, or the envelope. The envelope will expand and cool forming a red giant. The hydrogen burning in the shell will continue to deposit helium on the core, which will contract further. If the star is not massive enough (0.08 M_Sun > M > 1 M_Sun) to reach a core temperature that ignites helium (~10^8K), only a gradually cooling degenerate helium core, known as a white dwarf, will remain. These stars exist in the bottom left of the HR diagram. This will be the fate of our star, the Sun. Stars with sufficient mass (0.7 M_Sun > M > 2 M_Sun) will begin nuclear fusion of the helium in the core. This is often an explosive event, occurring when the core has reached ~0.5 M_Sun, in what is known as the helium flash. This process occurs very quickly and though the core expands even further and it’s temperatures will drop, the outer shells will contract. The cooling results in a decreased luminosity, while the contracting outer layer cause an increase in the effective temperature. Together these processes form the horizontal branch of the HR digram, between the red giants and the main sequence. Many of the stars in the horizontal branch will become RR Lyrae variable stars with pulsations driven by the Kappa mechanism. This mechanism is due to an instability in the radiative envelope. Normally, compression will cause the temperature and density to rise resulting in a lowering of the opacity. This lowering of opacity will allow more effective radiative transport and the temperature will stabilize, reaching equilibrium. However, RR Lyrae stars are thought to have a significant amount of partially ionized helium in their envelopes. This changes the way in which the opacity responds to an increase in temperature: rather than lowering, the opacity increases. The heat, unable to escape, causes a buildup in pressure until the envelope rapidly expands and the cycle is repeated. The time frame for these pulsations is on the scale of hours. Larger stars, 2 M_Sun > M > 10 M_Sun, have a more extended helium burning phase, sometimes referred to as the helium main sequence. Though helium burning is the primary energy source for stars in this phase, hydrogen burning via the CNO cycle will also occur in a shell. These stars can also develop a Kappa mechanism instability. However, instead of lasting hours, these pulsations last days or months. These stars, known as Cepheid variables, are commonly used as a standard candle because their pulsation period is directly related to their luminosity. Using this relationship, the distances to a Cepheid can be calculated with a high degree of accuracy. This is often how the distances to other galaxies are measured. Once the helium in the core is depleted, the carbon and oxygen remaining in the core will begin to contract. During this phase, the asymptotic giant branch, the envelope will expand again and cool forming a supergiant. These stars will have two different burning shells in their envelopes: fusion precesses will alternate between a hydrogen burning outer shell and a helium burning inner shell. These stars have very fast stellar winds and subsequently have a high mass loss rate. These winds will cause the outer layers to slough off leaving behind a degenerate carbon and oxygen core and eventually forming a planetary nebula surrounding a white dwarf. In much larger stars, M > 10 M_Sun, fusion of heavier elements may occur in the core. Carbon, oxygen, and silicon fuse until an iron core remains (fusion of iron and heavier elements costs energy, rather than producing it). In these stars, the iron core will become so massive that it will approach the Chandrasekhar limit, or about 1.4 M_Sun). Once this limit has been reached, the electron degeneracy pressure can no longer support the core and it will collapse. This process causes an explosion known as a supernova, leaving behind a neutron star, or in more extreme cases a black hole may be formed. The energy released from this explosion is thought to be responsible for the creation of elements heavier than iron.> Amid the darkness of a dying star, there is light to be found. As with most things in nature, the cycle of life continues. The material that was expelled from a supernova will create new metal rich molecular clouds. Like the stars they were born from, this material in turn will begin to collapse and the next generation of stars will be formed. They will be denser, will reach higher temperatures, and will generally have shorter lifetimes, but it is in this way that the galaxy will continue to evolve. The center of each star is the core, where nuclear fusion takes place and energy is generated. At the surface of the star, the photosphere, the optical depth rapidly falls off and the photons and heat are easily radiated away. Between the core and the photosphere, the structure of a star is determined by the most efficient form of heat transport available in each layer. Typically heat transfer will occur via radiative transport. However if the temperature gradient is sufficiently large (usually due to high energy production or a high opacity), convection will occur. In convection, rising mass (i.e., plasma) expands and cools adiabatically but still finds itself hotter and less dense than its surroundings - so it continues to rise. Conversely, sinking mass contracts and heats adiabatically but still finding itself cooler than its surroundings - so it continues to sink. These rising and sinking motions coexist in the form of a circulating cellular structure, producing turbulent boiling motions. The radiative/convective balance has important ramifications in all phases of stellar evolution (e.g. RR Lyrae and Cepheid variables) however, this section will focus on it’s role during the main sequence phase of a star’s life. The internal structure of stars consists of some combination of radiative and convective zones. The smallest stars, M stars, have a very steep temperature gradient between their nuclear core and their photosphere: these stars are fully convective. As stars increase in mass, they are able to establish a small radiative zone. As the mass of the star increases, the radiative zone grows and the convective zone shrinks. Convection in the Sun, a G star, occurs in the outer 30% of the interior. This creates cellular structures that come in a range of different sizes with different properties. More massive stars, e.g. A stars, will have only a very thin convective envelope. However, these stars have sufficient mass to begin the CNO cycle in their nuclear cores. The rate of energy production in the core becomes dependent on depth, producing another very steep temperature gradient and a convective core. For the largest stars, O and B stars, the convective envelope disappears completely while the convective core grows larger. Stellar Interiors. This image illustrates the radiative (blue) and convective (red) configurations of stars of different sizes.